At present the university has about 20 international relations and agreements with higher institutions and research centers of Russia, the Ukraine, Sweeden Portugal,Italy and other countries. Currently, Karakalpak State University is involved in six international projects carried out in our Republic’s Higher Educational System. Project coordinator, professor of Faculty of Natural Sciences and Geography is Polat Reymov. 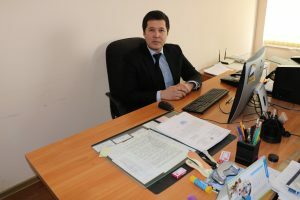 Project coordinator, professor of the department of сivil and economic law is Karlig’ash Umarova. University professors and students have opportunities to exchange, experience and to participate in different projects, international conferences and training courses organized by different foreign universities and international organizations. For instance,our professors, teachers and students are participating in training courses and seminars held in the USA, Russia,Portugal,Sweden and Israel. At present the university is working in collaboration with the agency KOICA and Lim Hiumin is teaching Korean to our students. Several seminars and meetings were held together with our masters, young researchers,postgraduates and Latvian professor, professor-teachers on the basis of UzWater project. The students of our university are taking an active partipation in international competition like «The Art of Republic Speaking» organized by the Embassy of Germany In 2014 Kamalova Svetlana, a student of Foreign Faculty, successfully participated in this competition. In 2015,a student of German Philology Pirimbetova Nazira became the winner of the 1st stage of the competition. In this 2014-2015 Academic year 15 foreign students were enrolled to our university, to get their BA degree. We have 69 foreign students in our university. 64 from Turkmenistan, 3 from Kazakhstan, 1 from Kyrgyzstan and 1 from Russion Federation. At Tukmen Department of Uzbek Philology Faculty 45 students, at English Department of Foreign Languages faculty 11 students, at the Faculty of Natural Sciences and Geography 2 students, at the Faculty of Physics and Mathematics 2 students, at the Faculty of History and Law 1 student, at the Faculty of Technology 3 students, at the Faculty of Chemistry and Technology 3 students and at the Faculty of Pedagogy 2 students are learning the secrets of science and knowledge.